The Rs.300 and Rs.100 issued by TTD to the local pilgrims in e-Darshan counters at Mahati Auditorium in Tirupati on Wednesday for Vaikunta Ekadasi and Dwadasi occasions, received overwhelming response from the masses. The issuance of these tickets started by 9am on Wednesday in two e-Darshan counters at Mahati auditorium. However within couple of hours serpentine queue lines have become the order of the day with devotees pouring in to buy these tickets. Tirumala Joint EO Sri KS Srinivasa Raju who personally monitored the situation, immediately directed the officials to start three more ticket issuing counters including one inside Bhudevi Complex near Old Alipiri Bus stand and two more near Alipiri luggage counters to avoid long waiting hours for the devotees in obtainining the tickets. Later speaking to media persons the Joint EO of Tirumala said, With a noble aim TTD has introduced issuance of Rs.300 and Rs.100 tickets on the two important festive occasions of Vaikuntha Ekadasi and Vaikuntha Dwadasi (which falls on 2012 January 5 and 6 respectively) for the sake of the pilgrims with a ceiling limit of 5000 and 30thousand tickets respectively. Out of this a quota of one thousand Rs.300 tickets(five hundred tickets on each day) and ten thousand tickets of Rs.100(five thousand tickets on each day) has been allotted for the local devotees. "The Rs.100 ticket holders have to mandatorily trek Tirumala either through Alipiri or by Srivari Mettu footpath routes. Their tickets will be verified in the ticket counters located along these two foot path routes", he added. Papamocani Ekadasi, or Papamochini Ekadashi, is observed during the waning phase of moon in the month of March – April. In 2012, the date of Papamochini Ekadasi is March 18. It is believed that observing Papamochini Ekadasi will help in the redemption of sins. Ekadasi fasting is dedicated to Lord Vishnu and is observed on the 11th day of waning and waxing phase of moon in traditional Hindu calendar. The importance of Papamocani Ekadasi was mentioned to Yudhishtira by Lord Krishna and is found in the Bhavishyottara Purana. Legend has it that an Apasara named Manju Ghosha lured Sage Medhavi into married life. After several years, the Apasara wanted to return back to Devaloka but this was objected by the Sage. But the Apsara was unwilling to listen to the sage and in anger he cursed the Apsara and turned her into a witch. The sage told her that she will be relieved of the curse by observing Papamochini Ekadashi. The sage too felt that he too had committed sins by falling into the trap of the Apsara and he too decided to observe Papamochini Ekadashi. Papa means ‘sin’ and ‘Mochini’ means to escape. Thus this Ekadashi exclusively helps in destroying sins and guilt associated with the sins committed. All the normal rules associated with the Ekadasi fasting is observed during Papamochini Ekadasi. Vijaya Ekadashi occurs during the waning phase of moon (Krishna Paksha) in February – March. In 2012, the date of Vijaya Ekadashi is February 17 - Smarta and February 18 - Vaishnava. The greatness of this Ekadasi is mentioned in the Skanda Purana and observing of Vijaya Ekadasi helps in removing all the guilt associated with sins committed and also helps in attaining victory. It is believed that Lord Ram observed Vijaya Ekadashi to cross the ocean to reach Lanka and defeat Ravana. Ekadasi is dedicated to Lord Vishnu and is observed on the 11th day of waning and waxing phase of moon in traditional Hindu calendar. It is believed that by fasting on Putrada Ekadasi one is relieved of all the sins committed. The greatness of this Ekadasi was explained to Yudhishtira by Lord Krishna and is found in the Bhavisyotara Purana. There is a popular belief that married couples without children will be blessed with children if they observe Putrada Ekadasi. Most Vishnu devotees fast on the day and some devotees do not sleep. Those people observing partial fasting abstain from food made of rice. Margazhi Month, or Margali Masam, is a highly auspicious period in Tamil Calendar. In the Bhagavad Gita, Sri Krishna says ‘Maasanam Margasheershoham’ - among the twelve months, I am Margazhi. 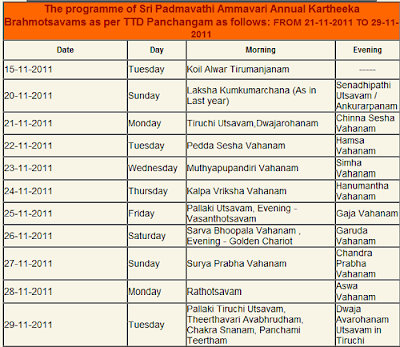 Margazhi month is from December 17, 2011 to January 14, 2012. The month is kept aside for spiritual activities and the chanting of Thiruvaimozhi and Tiruppavai of Andal. Vaikunta Ekadasi fasting is observed in this month. Another ritual in the month is the Pavai Nombu. Hanuman Jayanti is Tamil culture is also observed in this month. Arudra Darshan festival dedicated to the Nataraja form of Shiva is also observed in the month. Apart from this thousands of classical music concerts and dance programs are held in the month. The month ends with the Bhogi Pongal ritual. Tiruppavai is recited as morning prayer during the month of Margazhi at the Tirumala Tirupati Temple. The Mumbai city and pilgrim city of Tirupati shares a great spiritual bonding as the former houses the temple of Kolhapur Lakshmi Devi and the later Universal God, Lord Venkateswara and aspired that the relationship has been enhanced with TTD setting up information centre in Mumbai said the Maharastra government cabinet minister for Rural Development Sri Jayanth Patil. After inaugurating the sophisticated Information centre in Sion West, Mumbai on Thursday in his Chief Guest address, the honourable minister said, the Lord of Riches has finally showered his blessings on the country's commercial capital which is facing its bad phase of economic growth. "With the blessings of Lord of Lords, now nobody can stop our growth", he asserted. He asked the TTD to enhance dharmic and spiritual activities in the state of Maharastra. "About 40% of devotees to Shiridi temple are from Andhra Pradesh and similarly the temple town of Tirumala witnesses huge turn out of pilgrims from Maharastra. We not only reciprocate spiritual but also cultural relations. This bonding should grow to further levels in future", he aspired. The minister said the Maharastra government will extend full support to TTD to construct Lord Balaji temple in Mumbai", he added. Sri Satej Patil, Minister for Home in government of Maharastra after inaugurating the e-darshan counter asked TTD to start another counter at Kolhapur. "We are so grateful to the temple management for offering silk vastrams to Goddess Lakshmi Devi every year", he added. Later Sri Sachin Ahir, Minister of state for Housing in Maharastra cabinet who inaugurated the prayer hall in the information centre said Mumbai has a population of about one crore. "This information centre is sure to benefit the devotees of Lord Venkateswara to plan their pilgrimage to Tirumala", he added. He said TTD should set up information counter in every district of Maharastra. "We will extend our full support to TTD to construct Lord Balaji temple in Mumbai", he added. Speaking on the occasion TTD's Board Chief Sri Kanumuru Bapiraju said the massive success behind the growth of the temple administration of Tirumala Tirupati Devasthanams is the spirit of team work extended by its 10 thousand plus strong work force. "The recent brahmotsavams of Lord Venkateswara and Goddess Padmavathi are the best instances. We will continue the same spirit in organing religious and dharmic events across the country in future also. We are contemplating to organise Kalyanotsavams in four areas in Mumbai city soon", he added. Later he thanked Sri Jain, the owner of the building for providing the space to TTD to set up the information centre. Later TTD EO Sri LV Subramanyam said, the information centre in Mumbai has come up in the right time as the number of pilgrims to Tirumala from Maharastra are increasing by leaps and bounds day by day. He said the Balaji temple which is set to come up in Mumbai in future is sure to give religious delight to the denizens in the commercial capital of India. "If the Vibrant Mumbai turns in Spiritual Mumbai then the growth of the country becomes unstoppable", he asserted. TTD JEO Tirupati Sri P Venkatrami Reddy, CVSO Sri MK Singh, SE Sri Ramachandra Reddy, EE Sri Nageshwara Rao, Addl F.A&C.A.O, Sri O.Balaji, Special officer Sri Murali Krishna, other diginitaries Sri Kripa Shankar Singh, Sri Raviraj, local advisory committee members Sri Ranganathan, Dr Geetha Kasturi, Sri Sameer Mehta, Sri Kadambari were also present. Pushpa Yagam was performed in Sri Padmavathi Ammavari Temple, Tiruchanur with admist religious fervour and vedic chantings for two hours from 5pm to 8pm on wednesday. Nearly nine metric tonnes, comprising eighteen varieties of scented flowers like Sampangi, chrysanthemum, rose, lily, thulasi, Scent jaji, Lotus, Kaluva, Manoranjitham, Bilvam, paneer leaves,Dhavanam,Malli, Kankambaram, Ganneru, Mogilietc. were selected and used for the ritual. ‘Snapana Tirumanjanam’ was performed earlier in the day to the processional deity of Goddess Padmavathi at the ‘Mukha Mandapam’. Later, baskets full of colourful flowers were taken out in a procession from Asthana Mandapam to the Ammavari temple. Around 200 devotees took part paying a fee of Rs.516 per couple. The participants were given gifts comprising a 5 gram silver dollar, an ‘angavasthram’, a blouse piece, two ‘laddus’ and two ‘vadas’. Gita Jayanti, also referred as Bhagawad Geetha Jayanthi, is the day when the Bhagvad Gita was rendered by Lord Krishna to Arjuna in the Kurukshetra on the first day of the famous 18-day battle in the Mahabharata. 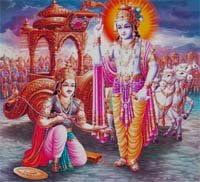 In 2011, the date of Gita Jayanti is December 6. Gita Jayanthi falls on the Ekadashi day of Shukla Paksha (the bright half) of the Margashirsha month (November-December) in traditional Hindi calendar. Utpanna Ekadasi, or Uttpatti Ekadashi, is observed during the waning phase of the moon in the month of November – December. In 2011, the date of Utpanna Ekadasi is November 21. The importance of this Ekadasi was explained to Arjuna by Lord Krishna and is found in Bhavishyottara Purana. For those devotees who like to begin the monthly Ekadasi fasting, Uttpatti Ekadasi is the Ekadashi that they should start with. Utthana Ekadasi, or Prabodhini Ekadashi, is observed during the waxing phase of moon in the month of Kartik (October – November). In 2011, the date of Utthana Ekadasi or Dev Prabodhini Ekadashi is November 6. The importance of Dev Prabodhini Ekadasi narrated to Sage Narada by Brahma. The divine conversation is found in the Skanda Purana. Observing this Ekadasi is believed to help in getting rid of the guilt associated with sins committed and is also a path to liberation (Moksha). Ekadasi is an important fast dedicated to Lord Vishnu. The famous Tulsi Vivah festival is performed on the day by some communities and also on the day after Ekadasi in some regions. The Chatur Mas period also ends with Prabodhini Ekadashi. The famous Kartik Month Pandarpur Yatra also concludes on the day. All the normal rules associated with Ekadasi fasting are observed on the day. Utthana Ekadasi, which falls in the Kartik month, is considered highly auspicious by Lord Vishnu devotees. Staunch Vishnu devotees observe a rigid fast on the day by skipping food and staying awake during night. Majority of the people take one meal mostly in the evening and visit shrines dedicated to Lord Vishnu. Rama Ekadasi is observed on the 11th day of the Krishna Paksha or waning phase of moon in September/October. Rama Ekadasi 2011 date is October 23. The corresponding moon in traditional North Indian calendar is Kartik month. In other regions it is Ashwin month and in Tamil culture it is the Puratassi month. It is believed that by observing Rama Ekadashi one can wash away all sins committed. The popular story associated with Rama Ekadashi is that of a prince who in spite of his physical weakness performed the Ekadasi ritual and got benefits of it during his next life. Ekadashi is an important day dedicated to Lord Vishnu in a Hindu lunar month and it occurs twice in a month. The significance of Rama Ekadasi was narrated to Yudhishtira by Lord Krishna and is recorded in the Brahmavaivarta Purana. All the usual rules associated with Ekadasi fasting is observed during Rama Ekadashi. Grains and rice are avoided on the day by devotees observing fast. మనం తిరుమల లో అఖిలాండ కోటి బ్రహ్మాండ నాయకుడైన ఆ శ్రీవేంకటేశ్వరుని దర్సించి, పిదప , విమానం లో వున్న వేంకటేశ్వరునికి దండం పెట్టుకుంటాం. ఇది చాలా మంది భక్తులు చేసేదే. అయితే ఇలా యెందుకు పెట్టూకుంటాము అంటే, చాలా మంది వద్ద సమాధానం వుండదు. ప్రతీ గుడి గోపురం మీద ఆ ఆలయం యొక్క మూల విరాట్ స్వరూపం చెక్కబడి వుంటుంది. అలా అని మరి మనం అన్ని ఆలయాలలోనూ, విమానం(గోపురం) లో వున్న వేల్పును కొలవటంలేదు కదా. కేవలం తిరుమల లోనే ఈ ఆచారం వుంది. ఇది యెందుకో తెలుసుకుందాం. శ్రీకృష్ణదేవరాయలు నాలుగవ సంవత్సరం లోనే రాజ్యాభిషిక్తులు అయ్యారు. ఆయన రాజుగా వున్నప్పుడు, ఆ రాజ్యపు రాజ గురువు వ్యాస తీర్థుల వారు అనుకుంటా) అన్నిటికీ పెద్దగా వ్యవహరించే వారు. తిరుమల ఆలయం వైఖానస ఆగమం ప్రకారం నడపబడే ఆలయం. ఆ కాలంలో ఒక భయంకరమైన వ్యాధి ప్రబలి, తిరుమల లోని వైఖానసులు అందరూ కూడా మృత్యువాత పడ్డారు. అప్పుడు స్వామి వారు, వ్యాస తీర్థుల వారి కలలో కనిపించి, "ఆలయం లో అర్చకత్వం చేసే అర్హత వున్న వారు యెవరూ లేరూ(అందరూ గతించారు), ఒక మగ శిశువు మాత్రం ఒక తల్లి గర్భం లో వున్నాడు. వాడు పుట్టి, పన్నెండు సంవత్సరాలు వేదం నేర్చుకున్నాక, మల్లి ఆలయం లో పూజదికాలు మొదలుపెట్టండి. అప్పటిదాకా నేను ఆలయ విమానం మీదనే వాసం చేస్తాను" అని శెలవిచ్చారట . ఆ విధంగా, విమానం లో వున్న మూర్తి లోకి స్వామి వారు ప్రవేసించారు. తిరుమల ఆలయం 12 సంవత్సరాలు మూసివేయబడింది. ఆ 12 సంవత్సరాలు కూడా, పూజాదికాలు విమానం లో వున్న స్వామి కే చేయబడినాయి. అందువల్ల,విమానం లొ వున్న స్వామి వారికి ఆ విశిష్తత యేర్పడింది.